Silent Victim No More operates from a strong and highly ethical foundation of values that ensures our commitment to successful creation of a worldwide movement of education and awareness to stop this hideous crime of the “Romance Scam”. As users of the Internet increase, so does the epidemic of men and women being scammed for money. It could happen to your grandmother, your grandfather, your mother, your father, your brother and/or sister, your aunt, your uncle, your cousins, your friends.…and yes, even you. Nobody is immune! 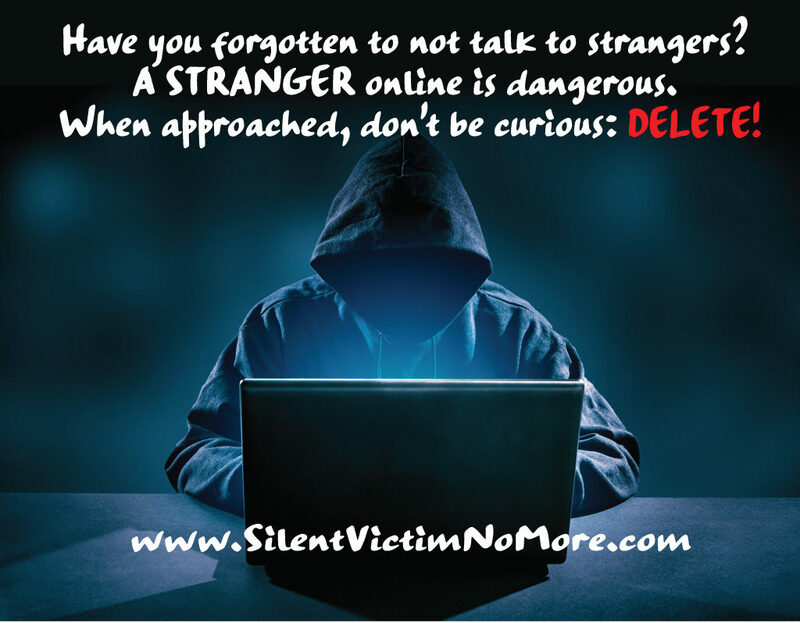 At Silent Victim No More our mission is to create awareness worldwide of the Internet Romance Scam, facilitate educational and awareness programs that will prevent innocent people from being scammed, and provide a safe environment for those who have been scammed. In this environment, victims will come out of denial, break free from their scammer, heal their hearts, learn healthy life skills, and regain their life back. They will go from being a victim to being an overcomer. Scammers will only do what brings them money. Once the achievement of our mission is fulfilled, people will be aware, educated, and no longer engage with scammers. This will cut off the cash flow scammers once enjoyed, and eradicate the Internet Romance Scam. No more innocent people will have their hearts broken, assets or identity stolen, go to jail or commit suicide. The billions of dollars that once left our country will now stay in our country and strength our economy. So, how large is the scammer’s playground just in the U.S.A.? However, most people do not report being scammed and usually lie about the amount in which they have been scammed. So, how HUGE is the scammer’s playground …just in Canada? So, how HUGE is the scammer’s playground …just in Europe? Lonely People: Loneliness across different age groups in 25 European nations, with a focus on people of an advanced age. After discussing issues of comparability, we present our empirical findings employing data collected in the third round (2006–07) of the European Social Survey (total sample size 47,099, age range 15–101) which included a ‘self-rating’ loneliness scale. Our results suggest that the prevalence of loneliness does increase with age for the combined sample. However, the nation in which one lives shows a greater impact than age on reported levels of loneliness, with Russia and Eastern European nations having the highest proportions of lonely people (about 10–34% for different age groups) and Northern European nations the lowest (mostly below 6%). Possible explanatory factors are identified and discussed, which provides the groundwork of a subsequent and formal study. [accessed Oct 19 2017]. Widows/Widowers: According to the 1989 census, in the age group 40-44 years, 4.1% of women and 0.7% of men, and in the age group of 50-54 years 12% and 2.3%, respectively, were widowed. In the last 20-30 years, widowhood has increased again. Divorced: In 1998, there were 71.3 thousand officially registered marriages and 47.2 thousand officially registered divorces. Handicapped: The total number of disabled people in 1992 was 81.2 million. So, how HUGE is the scammer’s playground …just in Australia? Lonely People: In 1997, 32% of older people aged 65 years and over lived alone. During their waking hours, these people spent an average of 79% of their time alone (12 hours and 26 minutes per day). Handicapped: 1,264,600 or 8.6% of the population are handicapped. As age increases the likelihood of being handicapped also generally increases.